The number of Hamilton models increased 10 fold over time. One reason for that is the addition of new types of movements, like automatics and the Electric grades. Additional factors like the case material allowed for an almost exponential increase in model count. The watch industry was especially cut-throut after WWII. European makers made excellent watches at relatively low price points. Having something for everyone must have been part of Hamilton's strategy and one of the reasons they were the last of the great American watch brands. For example, solid 18K gold models were the top of the line, other than a couple of platinum models. Then there were models in solid 14K gold and solid 10K gold. Hamilton also made use of 14K and 10K gold filled as well as 10K rolled gold plate and stainless steel. One of the solid 10K models was the 1959 Thin-o-matic T-300. It was produced through 1962. 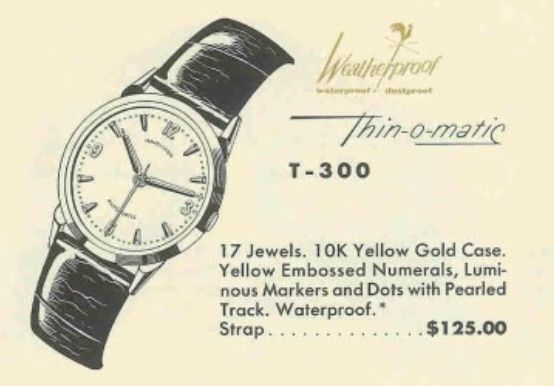 The Thin-o-matics were introduced in 1959 and the T-300 was on of only two Thin-o-matics to have a solid 10K case. Inside the T-300 you will likely find a 666 micro rotor movement or possibly a 663. I recently landed a T-300 and I think I got a great deal on it because it was listed with pretty poor photos and was described as gold filled. Looking at the front, you would think the T-300 might be part of the Accumatic like. It has very similar features, especially the luminous hands. Of course, looking at the back of the case, it's clear that the movement inside doesn't have a large rotor on the back of the movement - as that would require a pie-pan shape. This case back is perfectly flat. The back is engraved with a presentation from Stauffer Chemical Co. a maker of herbicides for corn and rice. It was acquired by another company in 1987 and no longer exists. The case is clearly marked Hamilton W. Co and was made by Biggs. The movement is very dirty and reminds me of the T-200 I recently did, except this one appears to be in good working order. With the hands removed, I can see the radium on the hands has left a slight burn mark on the dial. I'll see if I can remove it but it's not too bad as is. The movement is reassembled, excluding the rotating weight, so now I can put it on the timer. Despite having good motion, something inside is making extraneous noise. It doesn't take much to disrupt the timing... perhaps a piece of dust on the hairspring or filament touching the pallet fork. Re-cleaning the hairspring a couple of times eventually resulted in a clean signal from the timer. It's running a little fast but that will be easy to adjust. There, a slight tweak to the regulator index and the beat rate is right on the money. A new 29.5mm high dome crystal will make a big improvement to the looks of the watch. The crown on the watch is marked but it's not a Hamilton crown. I'm not sure what the markings are but I'd rather have an unmarked crown that an improperly marked crown. This crown is one 3.5mm in diameter. A 4.0mm diameter crown is too large to fit the side of the case. 3.5mm is really small, surprisingly small when the crown isn't installed. I'll add a new gasket to the back of the case. There was no gasket at all when I opened the case. I relumed the dial and hands and added a nice genuine alligator strap Other than faint marks still on the dial, this watch looks almost new.